beautiful designs to fit the most popular moulders. We service almost all wood shaping machinery Including: Weinig, William & Hussey,Shopfox, Woodmaster, Jet, Grizzly, Shapers, Planer/Moulders and more! Custom molding knives are ground fast, with blazing 1-2 day turn arounds. At Mouldingknives-quickly.com our main objective is to offer choice. We focus on providing a huge selection of moulding knife patterns in a wide array of steels, alloys & carbide to fit all your trim manufacturing needs. Whether your running one 10' custom stick or 20,000 lineal feet of MDF you'll find the best knife blade solution for your job. 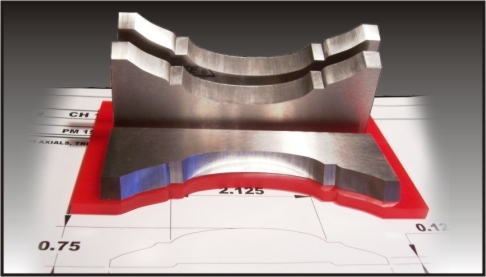 We are also a full service moulder tooling and industrial cutting tools supplier. We stock a comprehensive variety cutting tools for your whole millwork operation! Our prices are competitive but we never sacrifice quality. 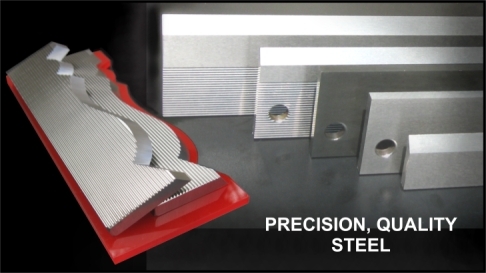 We use the highest quality steels and carbide. Our design and template making is done by CAD and the latest in CNC technology for perfect replication of submitted patterns. Our "Finish Ground" moulder knives are produced by high precision profile knife grinding, not by "waterjet" for a knife surface finish that is measured in the microns and actually shines. We use axial constants to speed set up times, Accu-align technology for knives that line up perfectly in your head, and Micro-Edge Polish for an amazing finish on your mouldings. Our knives produce the highest quality, professional results for today's fast paced wood industry! Economy M2+ HSS This is a great new line of affordable steel that looks and performs much the same as our premium steel, its good for short to medium runs in hard & softwoods. Great for those competitive bids. Available in 5/16" corrugated only. Premium M2-HSS: Industry standard in the woodworking field. Made from the highest quality alloys with strict machining tolerances for optimum production. It contains 6% Tungsten and 5% Molybdenum and hardened to 62 RC for better wear resistance in harder materials. M2 high speed steel is the guage that most all tooling steels are measured against. Great for medium to long runs in hardwoods and softwoods. Premium T1-HSS: "Best Value", Offers 20-30% or more in longer run times than M2 moulding knives. They are made from 18% Tungsten for extra long runs. T1 is hardened to 64 RC, and cuts and grinds about the same as M2. T1-HSS is a great choice for most industrial millwork factories that often have runs in excess of 5,000 lift in hardwoods. Black Nitride HSS: Black Nitride is a premium HSS with a case hardened and black oxide coating to resist wear and pitch build up. Black Nitride is another tool in your arsenal that can deliver 20-50% longer run times than standard M2 moulding knives, yet they are as easy to machine as standard M2. Our special case hardening procedure hardens the cutting edge to a depth of .010 and a high hardness of 73 RC, similar to that of (Opti Steel). V3 HSS: Is a high vanadium, longer wearing high speed steel alloy and is the latest in moulder knife life technology. It represents the best choice before resorting to carbide in hard to machine hardwoods such as hard maple and hickory. Vanadium carbide particle are in higher concentration with Cobalt for unbeatable wear resistance formula. Carbide: 10x's or more the performance of M2 steel. Carbide can be used for MDF or composites with great results. Available in Back-Pack style or inlaid per the best application. Replaceable inserts are available on W&H cutters. Let our tooling expert guide you when this is the best tooling alternative. ( ** ) Represents pricing for 1/2" depth of cut or less in corrugated steel only, deeper depth of cut may be slightly higher in price. Quoted prices are for "2 knife sets" in corrugated steel, prices are calculated per inch per knife. Discounts available for 3 knife sets in planer moulders, but slightly more for just grinding 1 knife. There is a minimum width charge of 2 1/4" per knife regardless of actual width of knife. Cope and sticks cost and extra $25.00 per set. Please call or email for W&H and Moulder/Planer pricing.